How did Jane Austen (1775-1817), a moderately successful English novelist in her own lifetime, become an international literary icon? It started long before Colin Firth’s wet-white-shirted Mr. Darcy in the BBC Pride and Prejudice (1995). 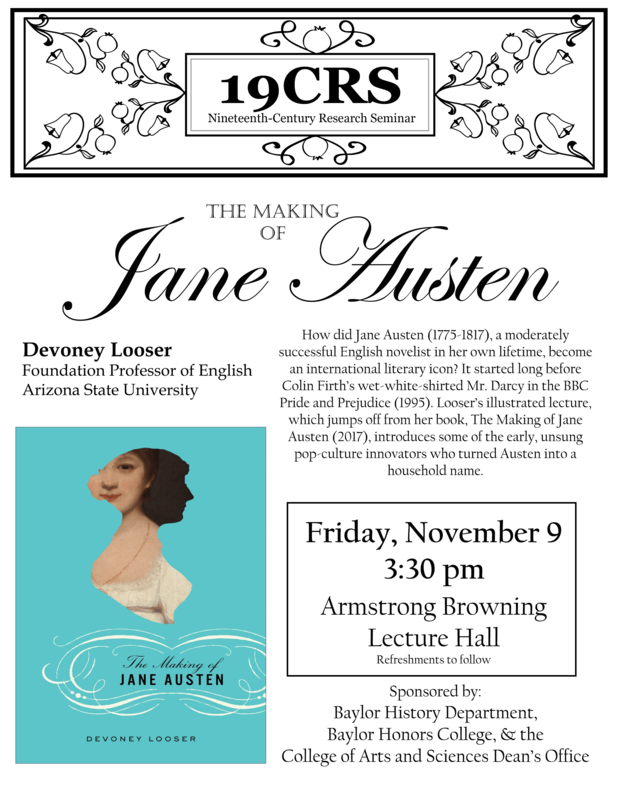 Looser’s illustrated lecture, which jumps off from her book, The Making of Jane Austen (2017), introduces some of the early, unsung pop-culture innovators who turned Austen into a household name. Refreshments followed in the ABL Seminar Room. Dr. Looser also contributed to the 19CRS collection of Learning Aids. Be sure to explore Teaching Jane Austen.